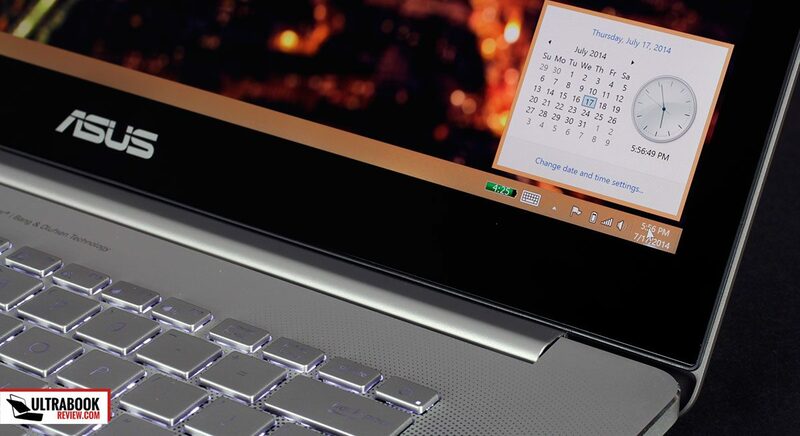 Summary: The Zenbook NX500 packs powerful hardware, a 4K screen and a big battery inside a sleek and beautiful body. But the performance under heavy load is not as expected, the keyboard is not great and the battery life is only average, which might not be enough to justify the high price tags. 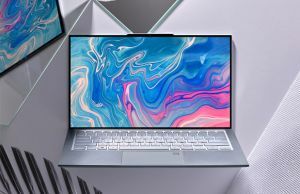 While Asus released nearly a dozen 13 inch Zenbooks in the last two years, they failed to compete in the larger segment of 15 inch multimedia ultra-portables, a niche dominated by the Apple Retina Macbook Pro or the Dell XPS 15. Not anymore though. 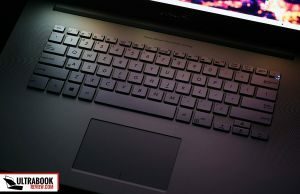 Asus announced the NX500 and the GX500 lines at Computex a while ago and is now time to have a detailed look at the Zenbook NX500JK, the top version of the NX500 series, in this post. The NX500 packs powerful specs, a high resolution screen, nice speakers and a large battery inside a sleek aluminum body and all these make it, on paper, one of the most interesting premium 15 inchers of the moment. But does it actually deliver? And what is it good for? Well, you’ll find the answer by the end of this thorough review. Before we start, here’s the disclosure. 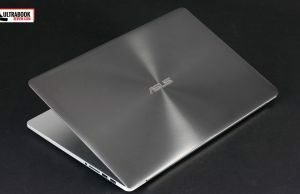 I have an Asus Zenbook NX500JK for this test, offered by Asus. I’ve used it for a little over a week and then it got back where it came from. On top of that, this is a pre-production model and not the final-retail unit, so it can have some issues that Asus is going to hopefully fix on the final models, which should be available in shop several weeks after the post-date of this review (July 23rd 2014). Even so, you’ll probably find this post useful anyway, even if you read it several months from now. 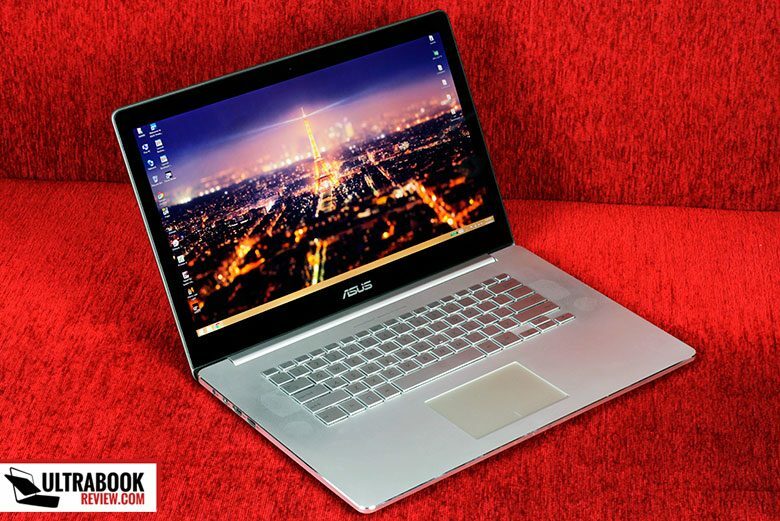 The Zenbook NX500 looks and feels how a 2G+ laptop should look and feel. 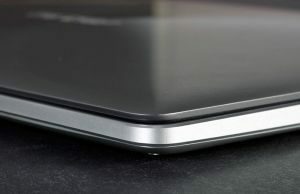 Its entire body is solid and made out of metal, but the NX500 has a larger footprint than the Retina MBP or the XPS 15 and is about half a pound heavier than those as well. The lid cover houses the characteristic concentric circles we’ve seen on all Zenbooks before, with a more subtle texture though, like on the UX303 I tested a while ago, which should make it less prone so smudges. 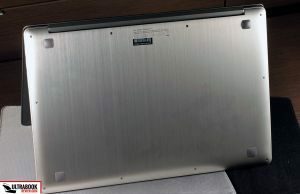 The bottom is strong and does not flex or squeak and you’ll notice that there are no cooling cuts over here, which on one hand allows you to place the laptop on any surface without worrying about obstructing the cooling system, but at the same time has an impact on running temperatures, as you’ll find below. 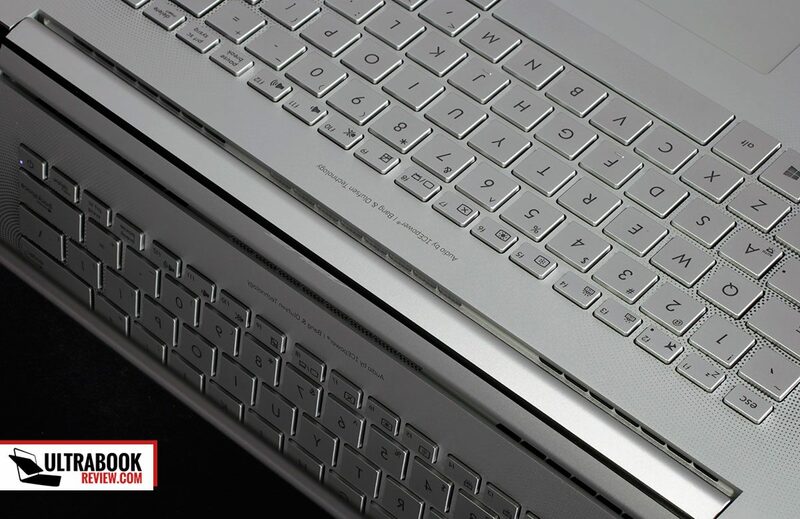 The interior is cast from a single slab of aluminum, with a large palm-rest, tapered edges and two grills of precision drilled holes that spread from the keyboard. This was borrowed from the N550 line and hides the speakers underneath, but if you’ll look at the laptop from an angle you’ll notice that the speakers only occupy two small areas on each side. Even so, there’s good quality sound coming out of this laptop, but more about that later. While we’re here, it’s worth mentioning that the screen’s hinge is sturdy, massive and keeps the display in place exactly how you set it up. You can only lean it back to about 130-140 degrees and that’s alright for a computer that’s going to spend most of its life on a desk. When it comes to ports, the NX500 offers pretty much the same options we’ve seen on the Zenbook UX303LN. 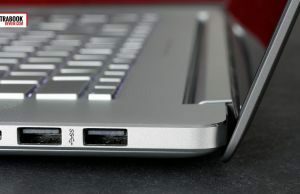 There are 3 USB 3.0 ports, a card-reader, HDMI and miniDP connectors, plus the heapdhone/mic jack and some very subtle status LEDs/mics on the front lip, but I wished Asus put at least one more USB slot on this device, which is after-all a 15 incher. They do however offer a USB to RJ45 connector in the pack, alongside a nice padded sleeve for this laptop. You probably noticed by now that Asus ditched the NumPad Area on the NX500 and as a result the keyboard feels very roomy, with plenty of space around it. 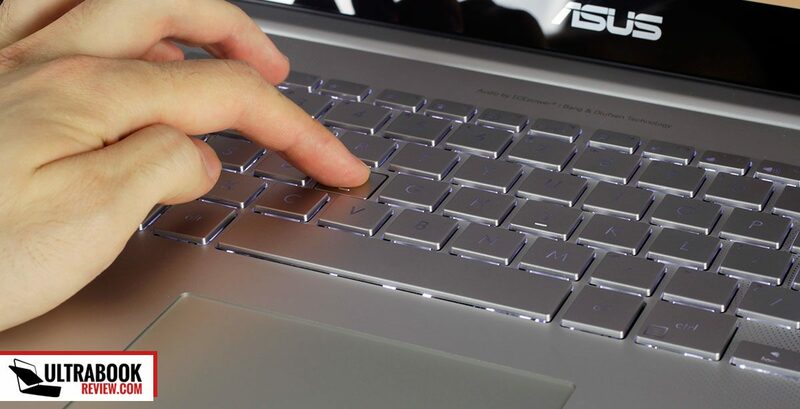 The keys are properly sized and spaced and the layout is a lot similar to the one on the Macbook Pros, with the smaller arrows and Function keys. That’s not a bad thing though, too bad this laptop does not borrow more aspects from the MBP. One thing could have been the contrast between the silver case and the keys. 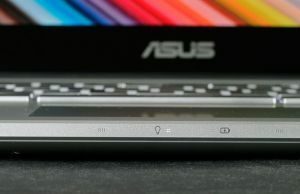 Asus put Silver keys on a Silver background on the NX500, which is both aesthetically unappealing and impractical, as the white back-lightning system makes the keys poorly visible when the illumination system it active. That’s why I actually turned it OFF, at least this way I’d have some contrast between the Dark Gray writing on the keys and the sea of silver around. The typing experience is good, but not great as it should be on a laptop in this price range, mainly because the keys are not firm enough and have a plasticky, slippery finishing. So you’ll end up missing some stokes from time to time. The trackpad however is quite good. It’s not very big, but it is properly positioned in the middle of the palm-rest and has a smooth glass surface which proved to be accurate and reliable in my tests. Performing actual clicks is not as noisy as on other Zenbooks I’ve tested, which is again something I appreciated, but the pad still misses occasional taps, which might steer you towards a mouse in the end. There’s a 15.6 inch touchscreen on this laptop, with a Sharp made IGZO IPS panel and a whooping 3840 x 2160 px resolution, with a 60 Hz refresh rate at 4K. 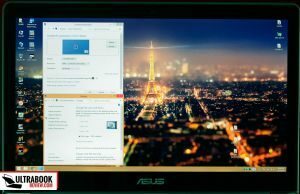 Needles to say you’re not going to be able to use it at native resolution unless scaling up the content, and Asus ships the laptop with everything scaled to 200% by default. 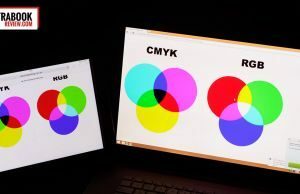 This translates in the same canvas size you’re getting from a regular 1080p 15.6 inch screen, but much sharper details, visible especially when browsing and reading texts. Keep in mind that not all third party software will scale well though, so you might end up having to handle minuscule texts and interface elements from time to time, but that’s a given with all high-res panels on Windows. You can of course change the screen’s resolution to let’s say 1920 x 1080 px with 100% scaling, but in this case everything looks slightly blurry, which you’ll notice when dealing with texts and fine details. So personally I wouldn’t go this way, unless playing games often. Some games will run in centered windows if the in-game resolution is lower than the resolution in Windows, regardless of the settings. In this situation, I found that I’d have to match the Windows res to the one I want in games in order for the image to stretch on the entire canvas. 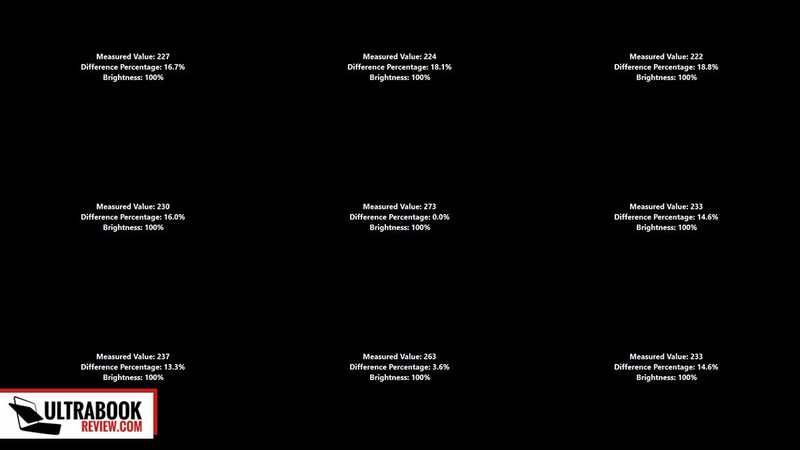 Black on max brightness: 0.36 cd/m2. The brightness and contrast are decent and they don’t vary in any way when changing the resolution. 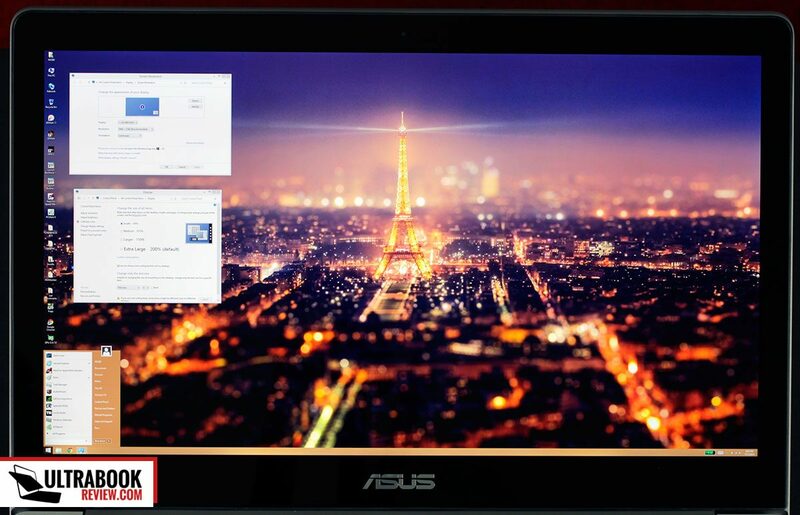 Asus actually advertised a wider gamut panel for the NX500 (100% NTSC) when it was launched and this sample is close. The colors are fairly well calibrated out of the box and the brightness distribution is decent, although the center is considerably brighter than the sides. Long story short, there’s a high quality panel on this laptop, as proven by the numbers above, but Asus needs to tweak it for battery use. 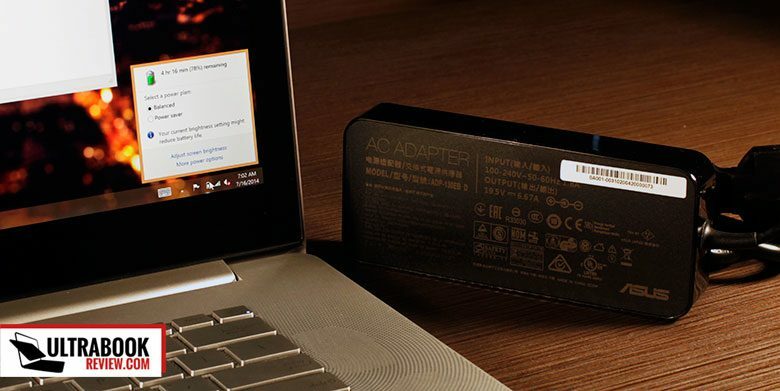 It should work the same regardless if the laptop is on battery or plugged in. Don’t forget I’m testing a pre-release unit here, so hopefully they will address the issues on the final retail models. There’s an Intel Core i7-4712HQ processor on this laptop and an Nvidia GTX 850M graphics chip with 2 GB of GDDR5 memory, plus the integrated Intel HD 4600 graphics. My configuration also comes with 16 GB of RAM and a PCI-E Samsung 512 GB SSD. CineBench R15: OpenGL 82.35 fps, CPU 490 cb. 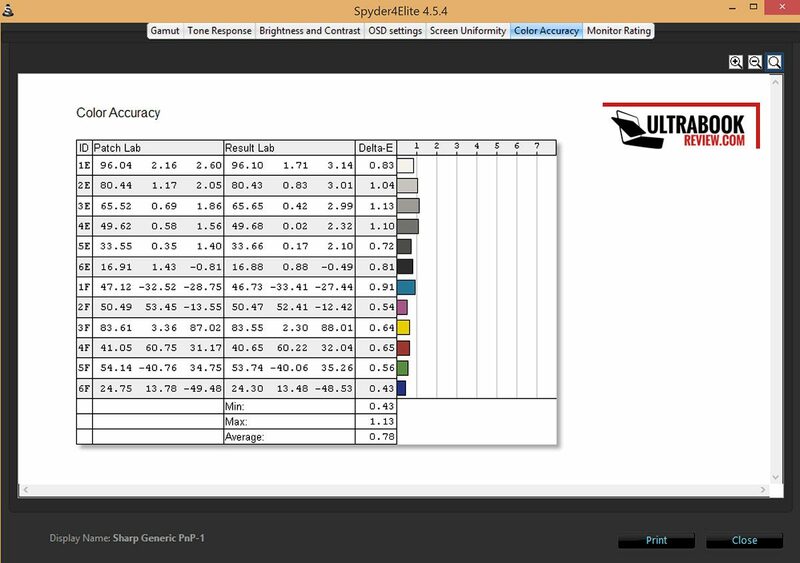 All the tests were performed with Nvidia’s 337.88 driver installed. 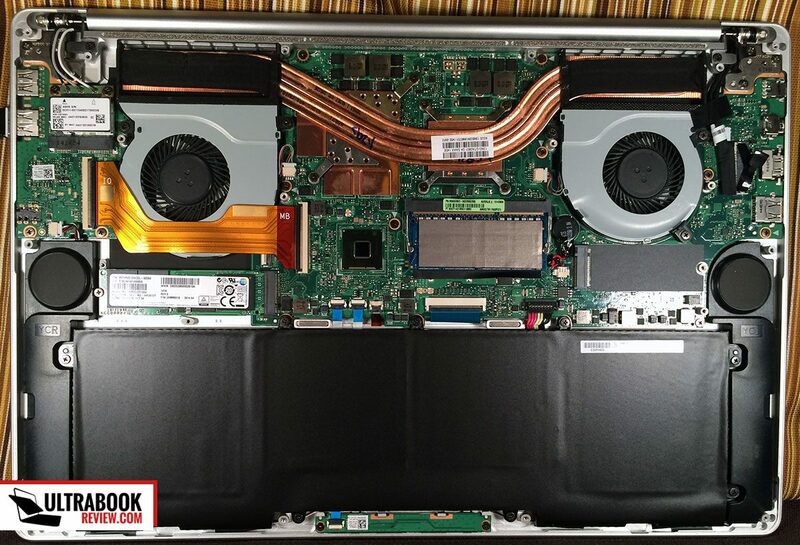 If you’re planning on upgrading this laptop yourself, have a look at the internals illustrated in the pictures below. 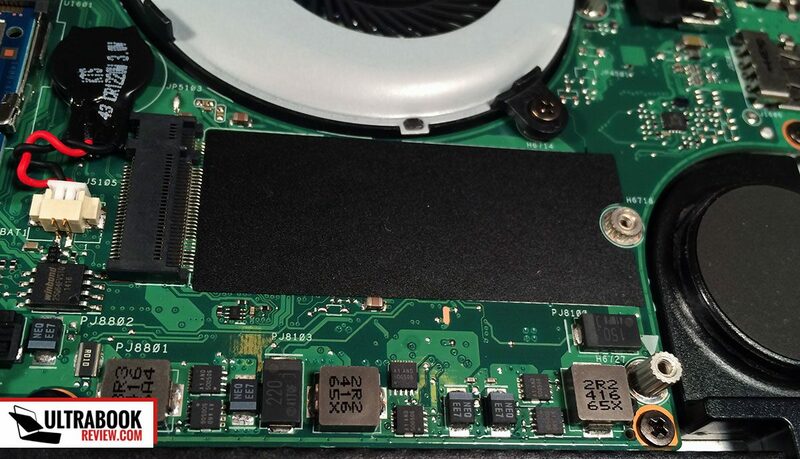 The CPU and the GPU are soldered on the motherboard and not-upgradeable. 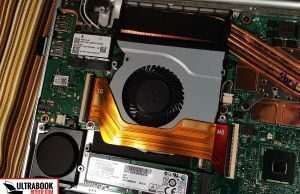 The heat-pipes go over them and are cooled by the two fans on each side of the unit. 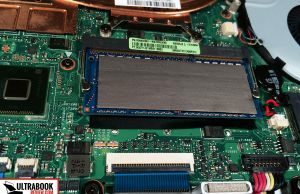 8 GB of RAM are also soldered on the MB, and there’s an extra DIMM that now has an 8 GB memory module in it, for the total of 16 GB. 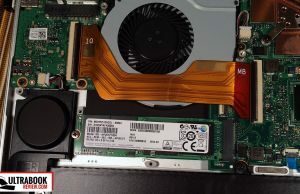 That aside, you’ll notice the M.2 NGFF PCI-E 512 GB SSD on the left side of the laptop, as we’re looking at it from the back, the Wi-Fi module on the top-left and another free M.2 connector on the right, which can take an extra SSD (looks like only a 60 mm card will fit in there, while the main connector is longer and can take a 80 mm NGFF SSD). Besides these, you’ll notice the battery on the bottom (under the palm-rest) and the speakers on the sides, firing upwards, through those holes in the aluminum case. Given the powerful hardware, the NX500 simply flies in casual tasks, with the CPU rarely passing the economical 0.8 GHz minimum frequency. 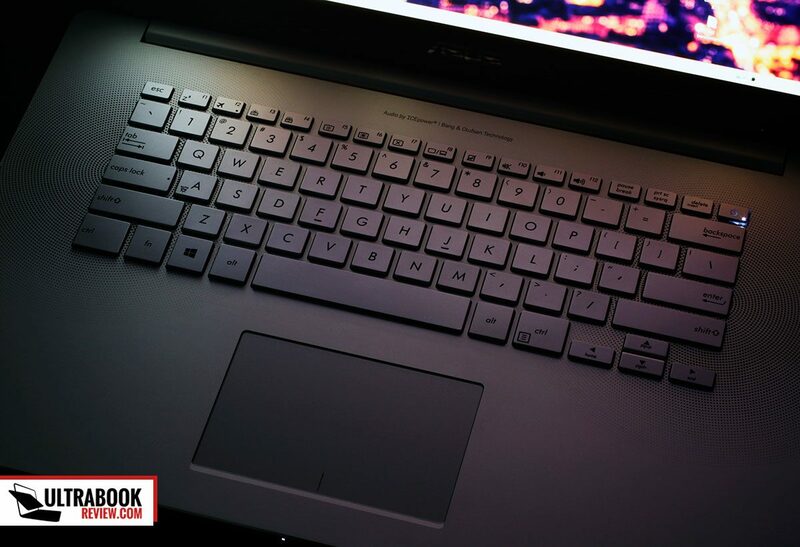 But the laptop can also handle serious work, from video and photo editing software, to programming solutions, all sorts of high-resolution video content and of course, games. The gaming experience is mostly alright, but somewhat inconsistent. You should not expect too much from the Nvidia GTX 850M chip, which is merely a main-stream solution; if you need a true gaming ultraportable, I suggest having a look at this article. 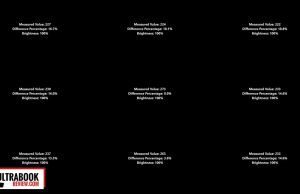 The NX500 cannot handle gaming at 4K resolutions, but is able to run well pretty much all the recent titles on 19 x 10 resolution with details set to at least High. Check out some results below (measured with Fraps). Judge them by yourself and let me know what you think in the comments section at the end of the post. However, while the numbers don’t look bad, the laptop tends to occasionally freeze when running certain games and that’s especially visible in titles like Dirt 3 and Grid 2, which require fast response times. I’ve logged the activity with HWInfo and it looks like the CPU throttles under load, as its Cores frequency even drops to 800 MHz for short periods of time and then bounce back again. The graphics chip on the other hand runs smoothly at 1149 MHz. I can’t say for sure if freezes occur exactly when the CPU throttles, but I can say that they were less freqent in titles like Tomb Raider and Bioshock Infinite than on those racing games. 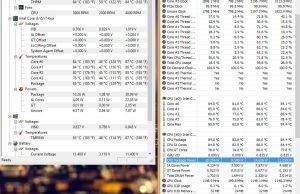 The laptop’s case gets hot while running games, but the internals reach temperatures of around 85 degrees Celsius (both the CPU and the GPU), which are not that high. However, HW monitor does detect CPU throttling under load which leads to a drop in frequency, as said above, which might be some sort of software capping designed to protect the silicone or some sort of drivers glitch. If it’s the first, something could be made. Asus could allow the CPU to reach maybe 90 degrees before lowering the frequency, that should be alright long term. If it’s the later, then a fix should be available by the time this hits the stores. BTW, room temperature was about 25 degrees Celsius while conducting all these tests. For now though, it’s impossible to draw final conclusions on the NX500’s true gaming abilities. This particular pre-release version struggles and freezes when running some games, which should not happen, despite the fact that the numbers (fps) are high. And this needs to get addressed before having the series officially released. Another thing worth mentioning involves the Battery Boost setting in Nvidia’s Geforce Experience, which by defaults limits frame rates on battery mode at 30 per second. That’s why it might feel that the laptop performs poorer on battery but that’s not the case if you disable the Set frame rate target on battery check-box from the settings. I also put the laptop through a quick stress test. 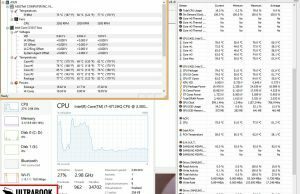 Pushing the CPU alone with Prime95 causes no throttling (all Cores run at 2.3 Ghz) and gets the Cores to about 80 degrees. 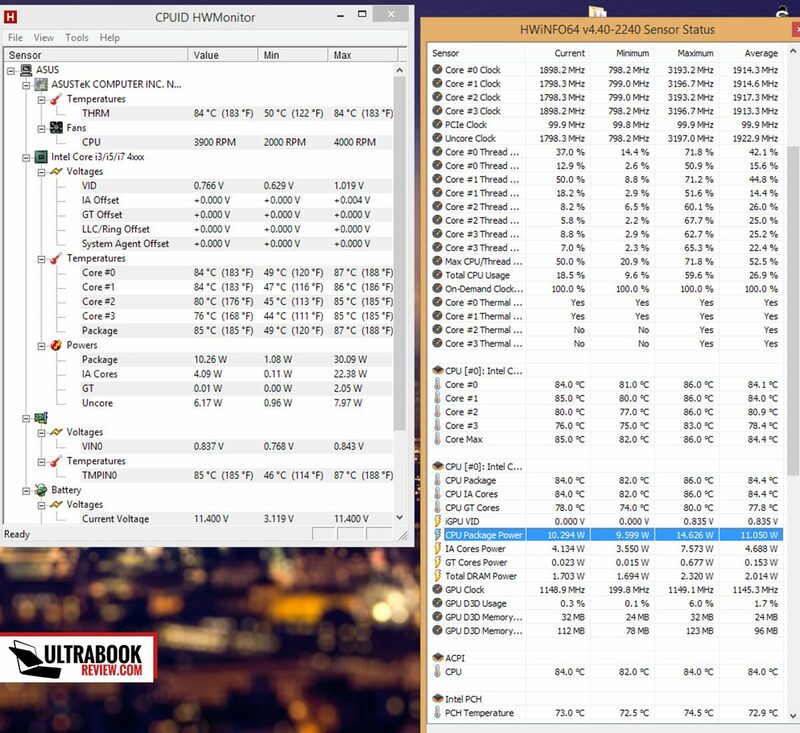 Launching Furmark while running Prime 95 immediately drops the CPUs operating frequency under 2.3 GHz and progressively crawls it towards 800 MHz, which it reaches and where it stabilizes in about a minute after launching Furmark. 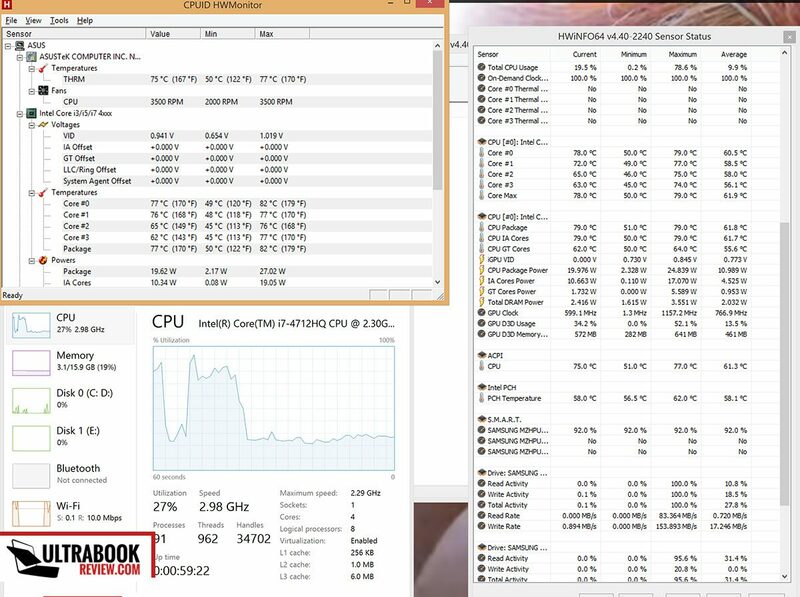 During this time, the GPU runs consistently at 1149 MHz and the CPU’s Cores get to 85-86 degrees. The situation remained unchanged for the next 5 minutes of running Prime95 and Furmark together, at the end of which I stopped the workers, as I didn’t want to push this pre-production model too much. In conclusion, the NX500 does throttle quickly to the minimum CPU frequency under the stress test, but the graphics do not. I was mentioning that the case reaches high temperatures when playing games and unfortunately I don’t have a proper thermometer to back this with numbers. 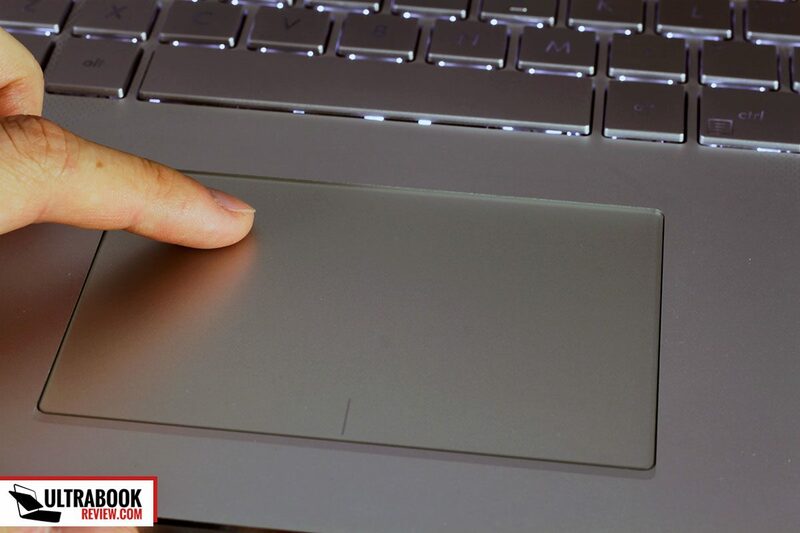 The area just on top of the keyboard and the exact same surface on the underbelly reach high temperatures though, high enough so they can’t be touched with your finger. So gaming on your lap is clearly not an option. 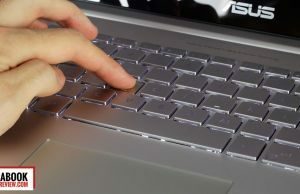 At the same time, the entire body gets slightly warm when playing games for hours, including the palm-rest and the keyboard area, which leads to unpleasant, sweaty palms. 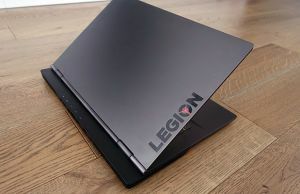 But to be frank, all these were expected from a thin aluminum made laptop like this one and the Zenbook doesn’t seem to get as hot as the XPS 15 does, for instance. 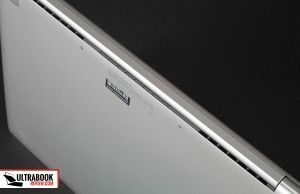 The cooling system is entirely hidden behind the screen’s hinge. From what I can tell, air is sucked in from the middle, just beneath the Asus logo, and then pushed out on the sides by the two fans. The NX500 tends to run fairly cool and quiet when not heavily pushed. Daily use noise is about 40 db at 50 cm from the screen, and gets to about 46 dB under load. The fans are always active though, even when using the computer lightly, and in this case there’s some sort of constant high-frequency whining/noise coming out of them that I personally found disturbing in a very quiet room. If you don’t plan on working in a silent environment tough, that shouldn’t bother you much. 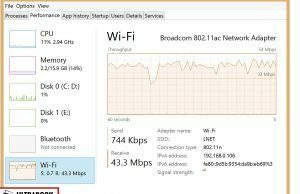 That aside, the NX500 packs a good Broadcom 802.11AC wireless adapter with Bluetooth 4.0 support, capable of delivering consistent transfer speeds even when a bit further away from my router. There’s also a Gigabit LAN module, if you need the wired connectivity, but you’ll have to use the USB to RJ45 adapter included in the pack. 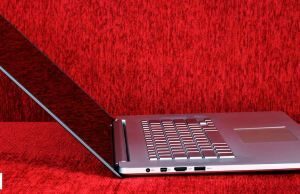 I’ve kept the speakers for the end of this post, although they are one of this laptops strong selling points. The NX500 packs a set of speakers made in collaboration with Bang & Olufsen, which sound good, by a laptop’s speakers standard. 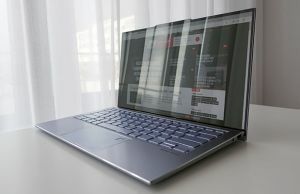 They do lack bass, as the old UX51 came with an external subwoofer in the pack, but the NX500 does not anymore, so if you care about that, this new Zenbook might disappoint. I for one am satisfied though, the audio coming out of this machine is punchy and loud enough for multimedia use and gaming. And if you need more, there’s always the option to connect an external sound system or use a pair of good headphones as the 3.5 mm audio-out is reliable and hiss-free (tested with my Nokia BH-905i headphones). average discharge of 50 Wh (almost 2 hours of life) when playing games, on High Performance, with Wi-Fi ON and the screen’s brightness at 50%. 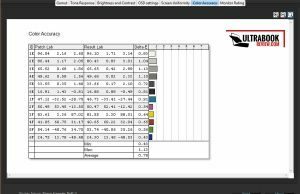 All the numbers are measured using HWInfo and HWMonitor. I also ran a PCMark 8 Home Conventional battery test on Balanced mode with the screen at 50% and got 2966 points and an estimated battery life of 3 hours and 24 minutes, if that’s of any help to you. I will update this section in the next few days. For now, I know that the NX500JK will sell for between 2000 and 2800 euros over here, which should translate in about $2000 to $3000 in the US, but I don’t have exact details on each configuration. So stay tuned. Follow the comments for other updates. It’s hard to draw the line on the NX500 right now, after testing this pre-production sample, which ended up having quite a few issues that will hopefully be addressed on the final retail units, including the glitchy display on battery and the lackluster gaming performance. If we look past these, the Zenbook NX500 presents itself as a really nice multimedia ultra-portable, with a beautiful and solid built case, an awesome screen and fast hardware on one side, but with only average battery life and keyboard quality on the other. And that might not be good enough when the asking price is North of $2000. 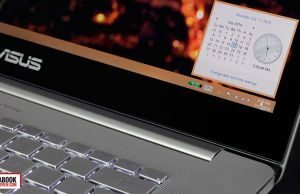 The Zenbook NX500 does not have a direct competitor that can match it hardware wise yet, but it will. Updated versions of the Retina Macbook Pro, Dell XPS 15 or HP Envy 15, all with Nvidia Maxwell hardware, will hit the stores in the next weeks and months, and the NX500 might, and I stress on MIGHT, pale in comparison when that happens. 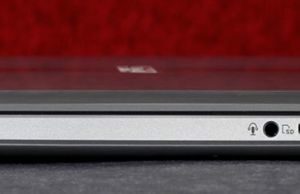 See this post if you want to find out how the Zenbook fares against the Macbook Pro and the Dell XPS 15. 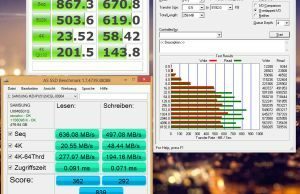 And these posts should also come in handy if you’re looking for a premium 15 inchers: my list of the best 15 inch ultrabooks of the moment and my list of the most powerful ultraportables. 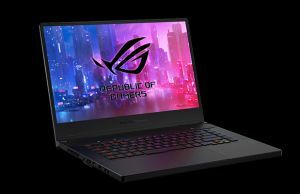 At the same time, Asus will release the Zenbook GX500, a similar laptop, but with a faster Nvidia GTX 860M graphics chip, which will offer a different color scheme, better performance and hopefully an improved cooling solution. But let’s not get hasty and wait for it to actually become available before drawing any conclusions. In fact, the same can be said about the NX500. This article shows what to generally expect from it, but we should wait for the final retail units to become available before drawing the line on this series. I’ll keep my eyes peeled and I’ll update the post with new links and helping info, once other publications get to test the NX500 in the future. Till then, this was my review of the Zenbook NX500. Feel free to add your feedback and comments in the section below and don’t hesitate to share this post around or show it to your friends if you found it interesting. Thanks a lot, Mike! Seems like I’m gonna wait for the next iteration of this with hopefully black keys on silver casing (just like they did it for UX303, for example) and an improved cooling system. I’d prefer a cooler long-living laptop over top-level performance, which it obviously can’t deliver with enough comfort. If you don’t need the dedicated graphics, you could check out the 15 Inch Samsung ATIV Book 9 Plus 2014, it might be better suited for you if you want a cooler-running device. Thing is I’m looking for a solid and cool-looking laptop which would be on par with (or at least close to) MBP, with some good keyboard as I type a lot, and with a top quality screen. And unfortunately I need Windows all the time for work, so this one seemed to be a perfect one on paper. But when it comes to a real product things get changed, obviously… Well, I’ll give it a try anyway once it’s launched here. Cz now I know where to check it more thoroughly, after reading your review. P.S. There are no Samsung laptops in my country anymore and I do need dedicated GPU for graphics. So ATIV Book is no more an option due to warranty reasons. But thanks for your idea! What’s the correct weight, 2.2kg or 8.85 pounds? One is of course not correct. Probably it should be 2.2kg/4.85 pounds. Thanks! 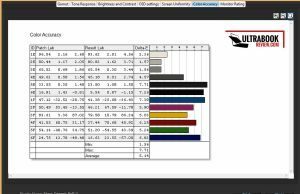 A final product review (with a good deal of negatives) on a pre-production unit…? That’s really weird. will get you a lot of traffic, though! Pay no attention to him, Andrei. These people will rush to making negatives without even making an effort to read the article from beginning to end. Yawn. @Dan, nice assumption, but I read the whole thing. I just think it is quite brave (and for some, quite misleading) to make a review based on pre-prod. Read the forum. People are deciding not to buy based on this. I trust people can use their brains when reading this and not make any final decisions based on a pre-production model. I’ve stated clearly in the title of the review that this is a pre-production model and that it could have some issues (it’s also in the first paragraphs and the conclusion). However, my experience with these Asus devices show that what I usually get is what they have 1-2 months before the actual product, so hardware wise things are usually almost identical. Software/BIOS wise, they could tweak the final unit. If you’ll look through my older posts, you’ll see that I’ve tested such products before and my conclusions were always (almost) spot-on for the final products as well. So, nobody should decide to pass (or not) on the NX500 unit based on this writing alone. However, they can make an idea on what to expect, the good and the potential bads. So it’s not realy 100% of NTSC as they said on Computex? That’s too bad…But I think 92% is close enough. Nice sharing, thanks a lot! I was a little bit confused by the disparity in Asus advertising 146% srgb and 100% showing up with the Spyder 4. 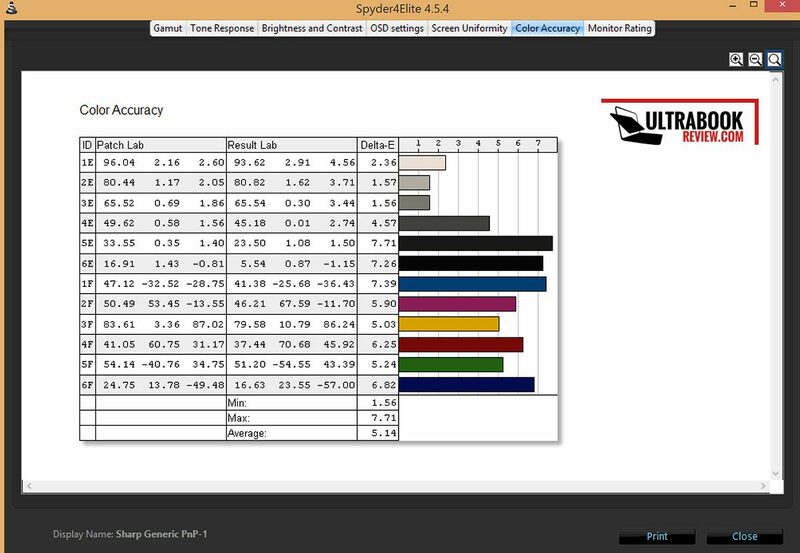 Could it be that the Spyder only will show to 100%? It seems like a large gap no? So…basically it isn’t good enough for such a high asking price right? depends. If they fix the performance problems, I’d say it is. I can’t think of a similar better Windows alternative right now. I’m like Pavel. 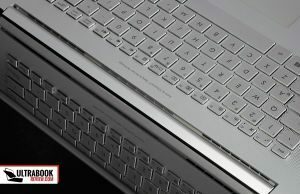 I’m looking for a nice looking laptop somewhat close to the MBP. I am hoping this could be the one. I’m a soon to be film student and would be using this mainly for video- and photo editing, and also to replace my old desktop PC since I’m traveling a lot these days (and kinda miss the portability). Of course I would like to be able to play some games on it now and then, but if the cooling system and everything turns out to be as sloppy as you make it sound, I feel like I should wait for someone to release a better alternative… or maybe in the end rely on the MBP. Though I’d want to install Windows on it which I think is kinda silly. Will you update the review as the final product comes out? If you can get your hands on it, that is. I don’t know your ways of doing these reviews. And thanks for sharing your thoughts about the product! I’ll try to get my hands on a final unit, but can’t promise. I will update it with links and feedback from other trusty publications though. Just saw a brief video-review of GX500: it does have a long vent grill on the bottom. So it should be cooler a little, I suppose, though having a risk of sucking more dust inside. But the body finish looks uncertain on the photos, so need to check it in person prior to making any decisions. You describe a high frequency noise. Are you aware, that the Dell XPS 15 9530 also has this very same problem? It doesn’t seem to be noise from the fans though, it seems to be coil whining. Somebody even suggested that the noise comes from the CPU. The issue that games are 1:1 in the center of the screen rather than scaled to full screen seems to be an issue with the nvidia drivers. The same issues existed with the XPS 15 9530, it seems. In my case, the laptop will see a lot of compiling (all (hyper)threads of all cores are going to be under stress) as well as some gaming (starcraft 2, diablo 3). 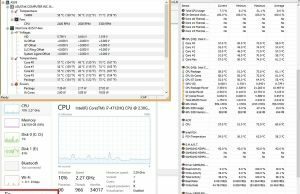 Now XPS 15 also seems to get very hot. And it has throttling issues too. 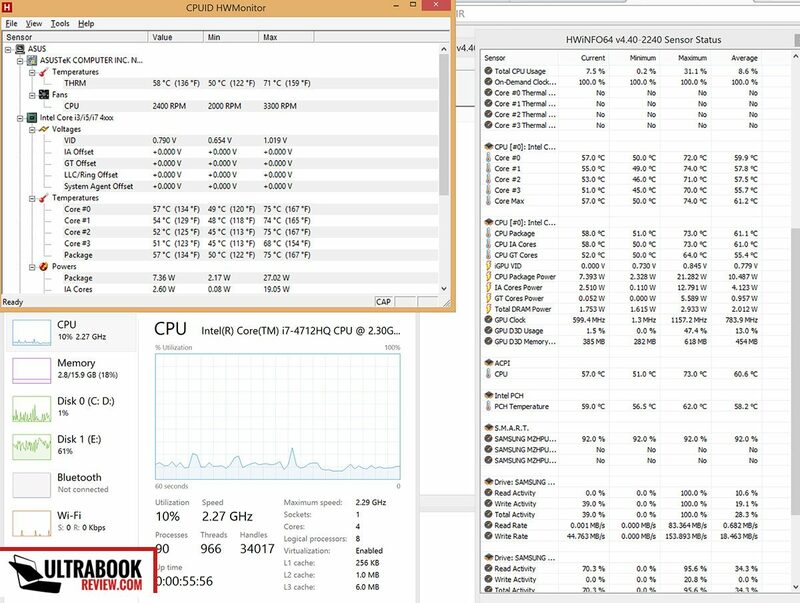 These laptops don’t seem to be designed for CPUs that powerful. Not at all. Now the full aluminium case makes it even worse, as it spreads the heat everywhere. That of course is bad for the battery as well! (Batteries suffer when they get warm, AFAIK). Also, the heat is blown out of the case towards the display. Is nobody worries about the display getting heated up? Also, are the microphones actually in the base unit, next to the power and the battery LEDs? If so, will they pick up the fan noise even more than they already do in my Dell E7440 (where they are above the display)? I will also type a lot (LaTeX, Java, C), and you say the keyboard is not great for typing? I really don’t care about the backlight issue. My fingers know where the keys are, and the backlight works when it’s dark, no? The backlit works, yes, but the writing on each key is barely distinguishable. It’s probably not something an experienced typist would worry, as like you said, one won’t even look at the keys. But it’s still something I found to be .. wrong. Not sure about the mics picking more noise than it should. In theory, it might be so, but in practice I used the laptop for a few Skype calls and performed fine. It’s true that a Skype call is not going to push the fans much though. If you’re thinking about recording yourself when playing games for instance, well, I guess noise could be an issue. I haven’t tested the XPS and can’t compare it to this Zenbook. Also, don’t be hasty to draw conclusions, I was only playing with a pre-production model and the whole overheating and throttling issues might be somewhat addressed on the final units. Is the screen glossy, matte, anti-glare(MBP alike)? Shame about the keyboard. Squishy keys result in finger joints pain for me. Why there is needed Mini-DP ? Some input on the video output possibilities would indeed be helpful. 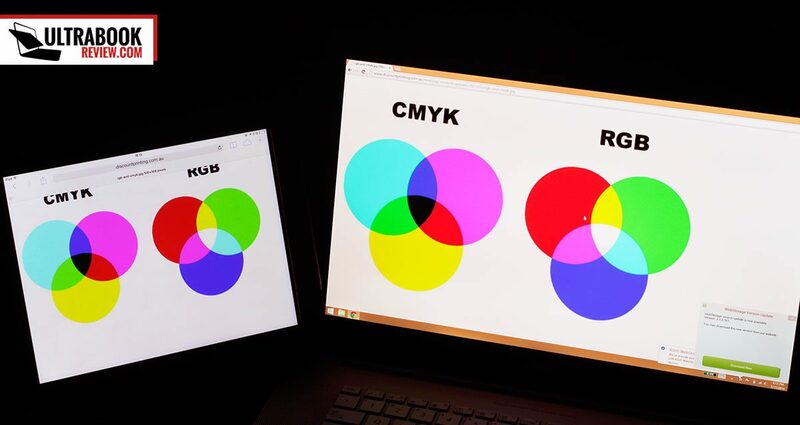 I’d like to know if its possible to have three displays running simultaneously – i.e. the notebook display and two externals? Also, is there any chance of finding out what the max resolution of the miniDP port is? well, there’s HDMI and miniDP on this laptop and I see no reason why you won’t be able to connect 2 different displays to these. However, I’m not entirely sure you can run 2 external monitors and the screen on the laptop at the same time. You might have to disable the latter. 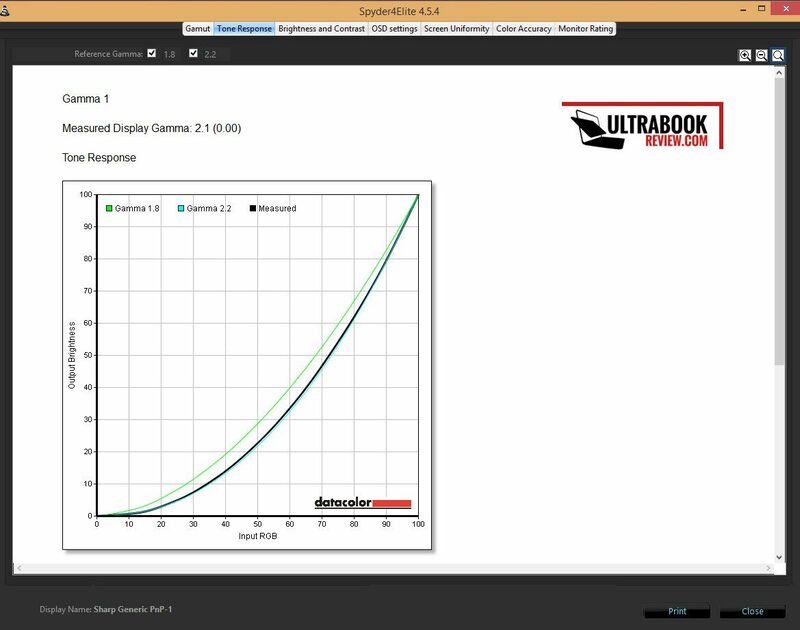 Anything up to 2560×1440 px should work fine when connected to the miniDP port and theoretically higher res panels should work as well. 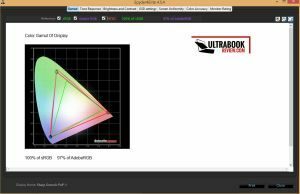 I can’t say if 4K panels will run at 60Hz or not though. 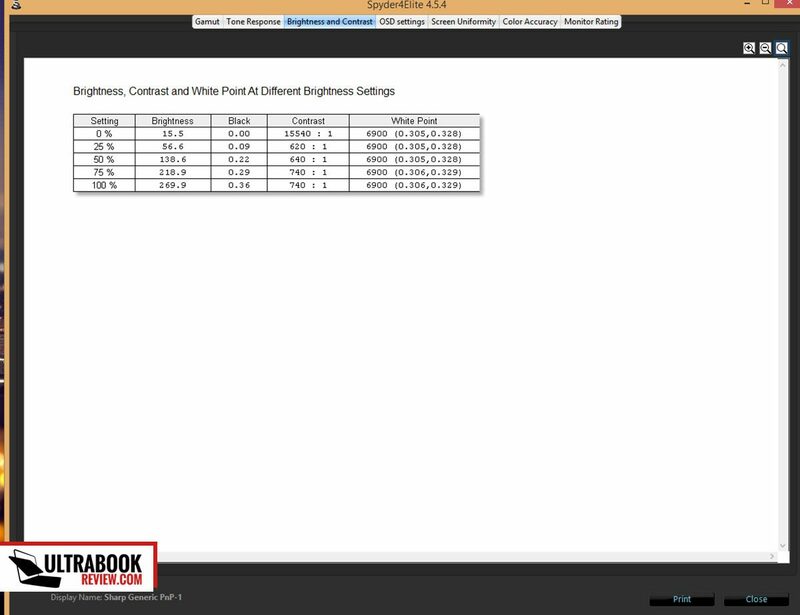 I actually haven’t checked that, but this should support the DisplayPort 1.2 standard, thus high-res panels. Thanks for your answer to my previous question. I’m looking for a subjective opinion now from you or any other visitors interested in responding. I jumped the gun and ordered the N550JK with SSD, even though I had my heart set on the NX500 for some time. I’m having some regrets now and was wondering what you (or anyone else for that matter) thinks about that decision. Personally, I feel that the GDDR5 memory of the GTX850 and the 4K screen are compelling reasons to go for the NX500. On the other hand, the scaling issues concern me (4k is not worth it if it becomes burdensome to use everyday programmes) as does heat build-up and throttling (i do some occasional heavy gaming – mostly less demanding games [League, DoTA] but for extended sessions). The design and build quality of this rig is also certain to be better. The major benefits of staying with the N550 are price (I’m guessing an NX500 with same size SSD [representing the middle configuration] will probably set me back €2000) which is €700 more than I’m currently paying. With the exception of graphics card I also think both PCs will perform similarly. Well, unless you really want the 4K wide-gamut screen and the sleeker body, I’d go with the N550JK. It’s the better deal for the money, imh. The base version of the NX500 is goign to start at roughly 2200 euros from what I’ve been told, but these are just estimations right now. I’m not sure what the config in goign to be, but I’ve been told this will sell for between 2200 and 2800 over here in Romania. Another thing to keep in mind are the overheating and the throttling problems I encountered on this pre-release version of the NX500. They might be addressed on final versions, but I woulodn’t hold my breath for that. 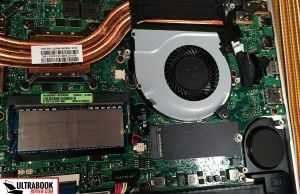 My experience shows that Asus rarely fixed the quirks I’ve found on pre-release models. Hopefully I’m wrong here. 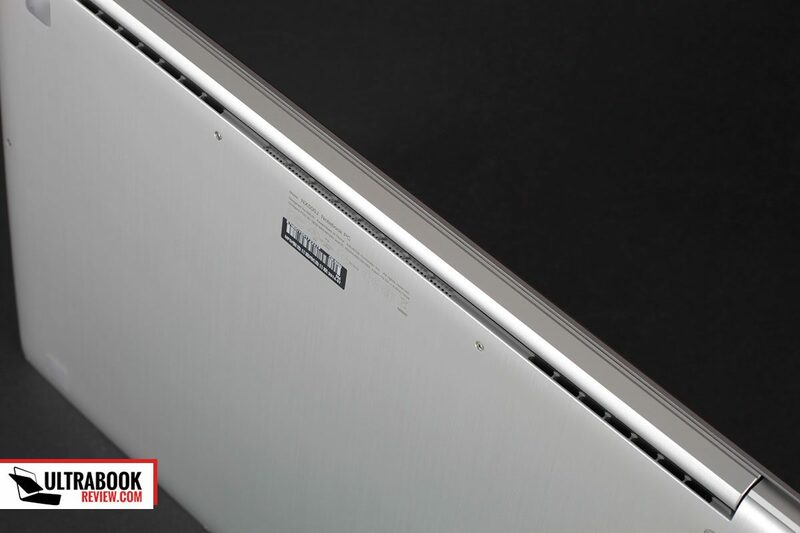 You could also consider the GX500, with even faster graphics and hopefully superior cooling. But that won’t be available until Q4. It supposed to be around 1600-2000 euros for 850M graphics and 8 GB of RAM. After him must come GX500 which logically shouldn’t exceed price more than 2500 EUR (MBP max price). Otherwise Asus will start getting problems with finance strategy. If it will be truth, what you said, then will be good to get the same from Dell which notebooks price already lowered until 1800 EUR. Amazon UK has already some ready information about preordering, can you say, is it OK, that specs at Amazon.co.uk differs from yours? Who lies, or will be much configurations of processors, Ram and storage? That’s what I was told at the time of the review. It’s true that they might change the pricing policy by the time this gets in store in order to be more competitive. So, let’s not get hasty and wait for more details. 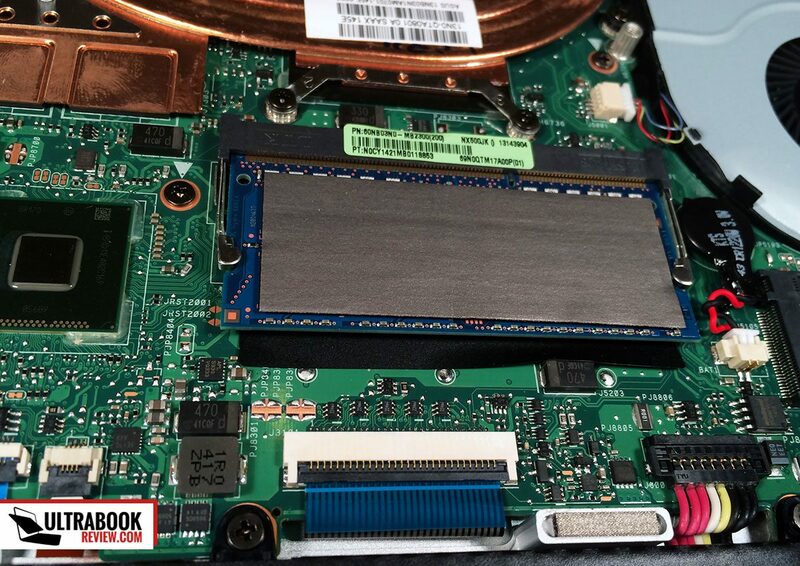 BTW, how big’s the SSD you’ve got on that N550JK config? 256 Gigs? The version with the 1 TB HDD sells for about 1100 in most European countries and 200 extra can get you a bigger than 256 Gb SSD, plus waht you’ll get from selling the HDD on ebay or something. That if you’re willing to replace the HDD yourself and, very important, if this process does not VOID warranty ion your country. Asus have this clause in some regions. The SSD is 256 GB. I plan on replacing the CD drive with another SSD at a later point, when I will also upgrade the RAM. 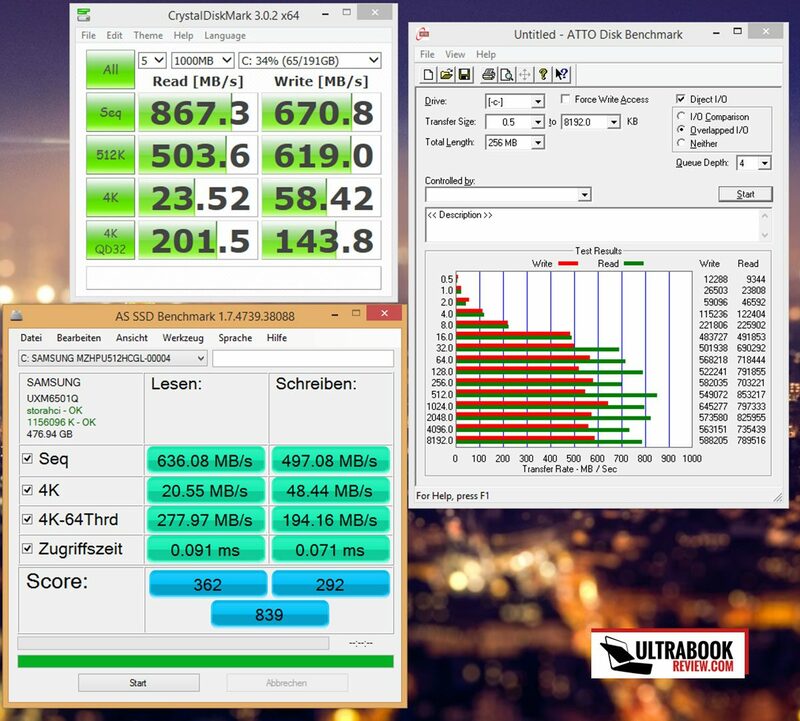 As far as I know, in Europe, Asus only retails a 256 gb SSD model – the other models all have HDDs. Yeah, I’ll keep an eye out for the NX500 at IFA next week, we might find out more about prices and delivery dates. I just noticed the NX500 is listed on Amazon.de now too. Seems to be the same model as Amazon UK. The price is € 2,200. Its not being sold by amazon however but rather by a marketplace vendor from Italy. Indeed. Although this is probably not the top version (it has only 12 GB of RAM), I wouldn’t expect the price to be significantly higher. Of course this is assuming that this particular vendor is selling it at the right price. Please report back if you do. I’ll do the same if I get anything new. I just checked three websites , which shows ETA on 26 September. Two models will be available in Germany soon: the DR017H and the DR018H. MediaMarkt has listed them. The 17H will be available October 15th and the 18H will be available September 20th. Unfortunately, the 18H only has a 256GB SSD. The 17H has a 512GB SSD. Prices are 2399€ and 2199€. Hi Sven, thanks for this, I’ll add the details in the review. Looks like I was about right, this will be pricey. I keep checking the pricing updates as well and still hope that in US it’s about to be selling for less, so I could get it from there. If the price in my country matches the listings on Amazon, it’s not worth it, imho. Even for it’s pros like wide-gamut screen and huge battery, 2400 EUR will be just too much for a laptop based on “design over functionality” idea with an average keyboard and scaling issues. Make it 20% cheaper than rMBP and I’ll buy it, make it equally-priced and I’m now way near of getting this. Or I’m about to wait for an upgraded one with Broadwell chips and black keys to justify the price. As you may have noticed, it was a big fat lie. The shops that listed the NX500 with availability in October changed the availability to “unknown” now. Also, all my inquiries to local ASUS partners in Germany have shown, that the NX500 is not even listed in any of the price lists available to them. don’t know if it is true, it is not yet visible on asus.pt. Looks like it will be $2699 in the US. Is this what was expected? How thick is the back cover aluminum plate ? 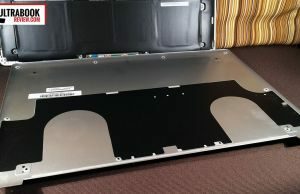 I found a few current ASUS laptops have very thin aluminum plates on the backside. Also, there seems to be an empty slot of M.2. Is that for additional storage ? I should clarify what I asked about the free M.2 slot. 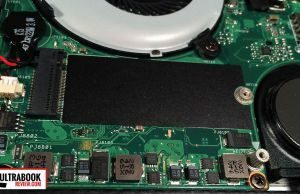 Is it a bootable storage port (visible in the EFI/BIOS) ? 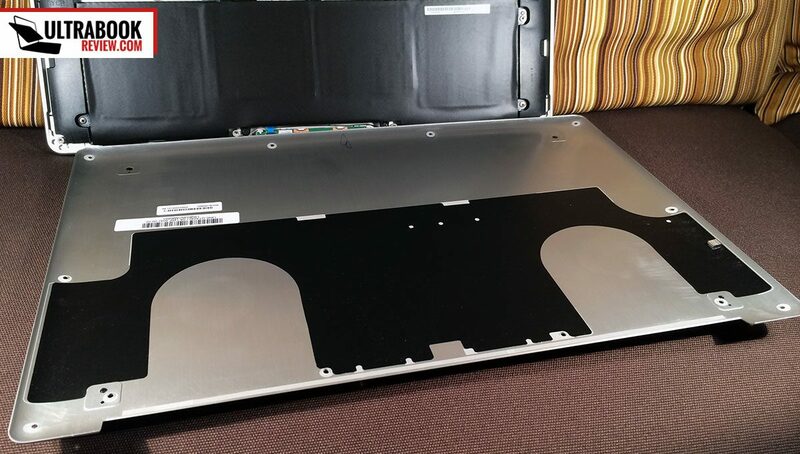 1) How thick is the bottom aluminum plate ? Is it thicker than the N500J series ? 2) Is the spare M.2 slot bootable ? Sry, I’m manually reviewing each comment on the site, so it takes a few hours to get them online. This way I can reply to all the questions. Not sure how thick the back cover was, but it wasn’t a thin sheet of metal for sure. It felt fairly strong. And yes, there’s an extra M.2 slot in there. Either it’s bootable or not, that I do not know, I did not have a compatible Stick to try it out. But why would you need it bootable anyway? Thanks for the reply Andrei. I sometimes dual-boot my laptops and I prefer putting the OSs’ on separate physical drives if possible. Do you have experience with Lonovo’s Y50 or Y40 models? If you do, how would you compare them to NX500 in terms of sound reproduction? I’ve had MSI GX660R and now in the market for a new stylish and more portable laptop with great speakers like on my previous MSI. Any recommendations? Sry Alex, I haven’t got my hands on either of these Lenovos. I’d expect they’d be worse then the NX500 in terms of sound, but I’m not 100% sure on that. I do know that people have been complaining of the Y50’s screen. Derek, who is a coauthor here on the site, bought a Y50 a while ago and then returned it. In the meantime he ended up with the MSI GS60 Ghost Pro. 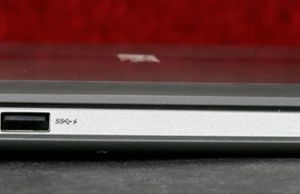 You could drop him a line on this review, maybe he can help you out: https://www.ultrabookreview.com/5337-msi-gs60-ghost-pro-3k-review/ . Thanks man, I’ll sure ask him. What’s about screen protection ? You used it a whole week and how’s it for you ? I mean , is it covered by Gorilla Glass or with similar technology ? Some sort of glass but can’t say for sure whether it’s Gorilla or something else. 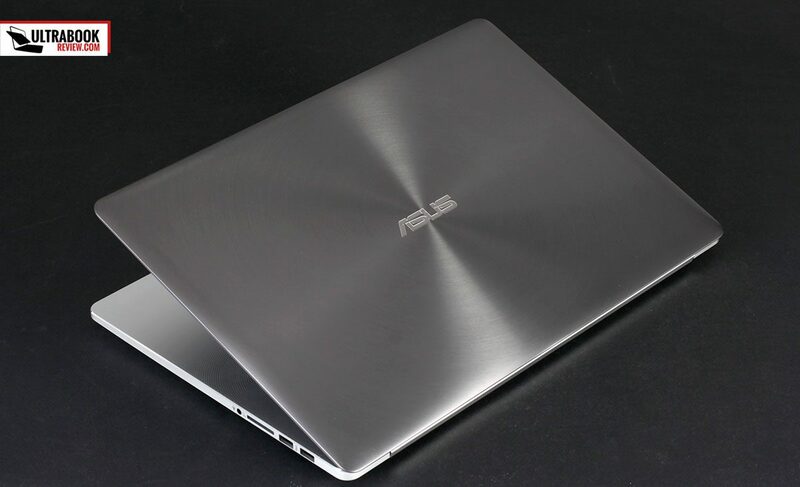 I just watched what is called the “official presentation” video which was uploaded today for the Asus Zenbook NX500. The keyboard background looks like it is black, not silver, a change from the version in your review. Any comment? Any new info? Cool. I don’t have any info on that matter, or anything new whatsoever. I’ll keep my eyes peeled for updates though, hopefully the black background makes in into the retail units. 0:32 – bottom side is not straight. 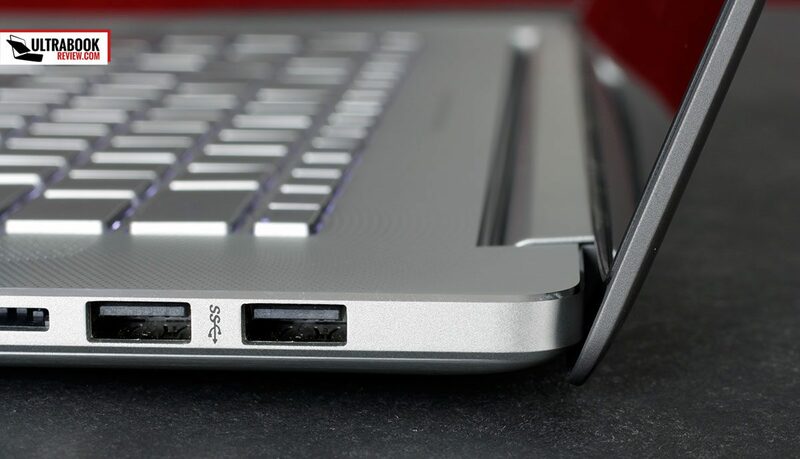 1:02 – One USB 3.0 ? Are you kidding ? Hmmm, what are you talking about? This video is not related to the NX500. In any cases this video is so old , it presents probably UX301LA. Or I’m not right ? Oh, you’re so right. Didn’t check it out properly in the beginning, although I noticed that’s not from an official Asus channel. I believe that’s actually the UX31A, with the all aluminum body and 2nd gen hardware. Sry I didn’t pay closer attention, I’ll be more careful . BTW, did you guys see the recently announced HP Omen 15? Too early to say for sure of course, but looks like a proper competitor to this Asus, and quite a lot cheaper. I bought one of them already , waiting for shipping. Will be great if you could comment in performance and throttling once it comes and get to spend time with it. Sorry , I was wrong about exact country. It was released in Europe (In Germany). MAX, that link isn’t working for me.. 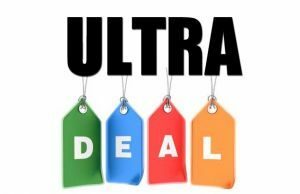 I searched the whole site and found nothing including ended items for the last 2 weeks, on eBay UK. Your link shows 256gb I am only looking for the 512gb but the link is not valid. It’s better to bring this computer , because in any cases there will left another one slot for M.2 SSD. You can add to current 256 GB other 256 GB of SSD. Hello, so I got it from Yesterday. And can tell to you quick overview about it. 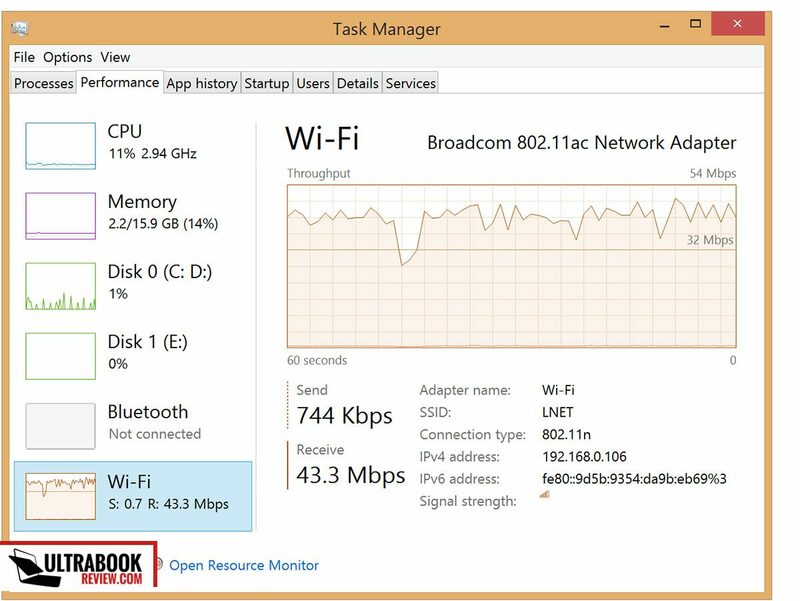 About throttling, I didn’t found the problems with decreasing frequency. BUT , I tested only one game, because I don’t have enough time to test it. I forgot to turn off Battery Boost and Vertical Sync for 4K in League of Legends but FPS is impressive. On the weekends I’ll publish detailed information to you about all stuff. 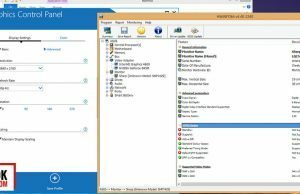 There’s only one minus – Windows doesn’t scale properly items and windows of programs on 4K resolution. BUT , if to set 150% scale instead of 200%, then it would be ok for you. If you’ve problem with eyes (I mean you’re wearing glasses) , then I’ll suggest you to think deeper – do you need to get it or no. Ah , yes , you forgot to mention in review about “Auto Correction of Display Brightness” – there’s a sensor , which choose for you optimal brightness , based on where you’re working with him. You can toggle it , sometimes it works perfect , sometimes and I’m configuring brightness manually. Backlight became lighter and now it doesn’t mix with keys. As I saw , your pre-production model has only 1/3 of all light , which support this notebook. In short overall – I’m happy with this. Mike – I’ll keep with you information on the weekends (probably via Email). Hi Max. Thanks for your input. 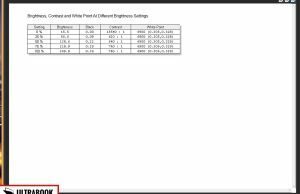 The Auto Brightness sensor is standard with most mid-range and premium laptops, that’s why I haven’t mentioned it in the post. And to be frank, I disable it, I like to set my brightness manually. It’s nice that there’s no throttling, but if you can play some more demanding games, I’d love to hear your thoughts, here or on email, wherever you prefer. 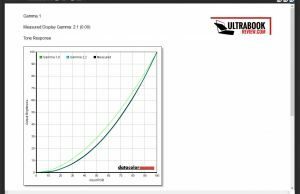 Scaling to 200% should look sharper than scaling to 150% only, from my experience. What exactly isn’t scaling properly? Everything or only some third party apps? I’ve read somewhere that the keys of the keyboard are made of metal. Is this true? Do the keys feel cold when just started up? Any news on availability? I cannot find it in stock anywhere in Europe? Some readers reported they already got their units in Europe, check out the comments above. Heat issues? There aren’t any unless it throttles with full CPU and GPU utilization. Though user comfort is something to think about.